Mary and I were ramblin’ around North Georgia Mountains on Hwy 197. It was an early spring day and we stumbled upon Hickory Flat Pottery. We got to meet the owner, Cody Trautner, take a tour of the pottery, and explore a relationship. We liked Cody’s new earth-tone functional pieces and bought most of what he had and are ready to order some more for Pixel Point’s Artisan Gallery! Cody was born in Fargo, North Dakota and raised in Moorhead, Minnesota. After taking pottery courses in high school, he set up his own small studio and began working with clay. In 2010, he earned a BFA in ceramics from Minnesota State University of Moorhead (MSUM) – after which he taught wheel throwing and hand building ceramics. 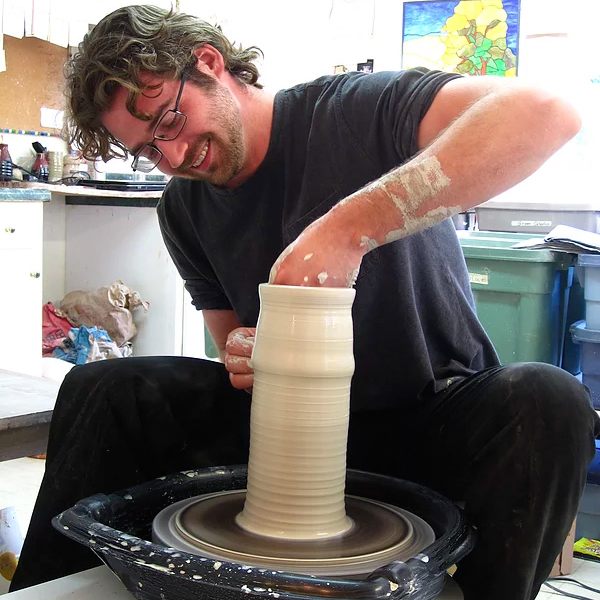 His position as resident potter at Hickory Flat Pottery began in May 2012, where he is now owner. His current work focuses on functional pottery and experimenting with salt-fired pieces. His most recent work is inspired by the foothills of Georgia, where he strives to capture a time and place.